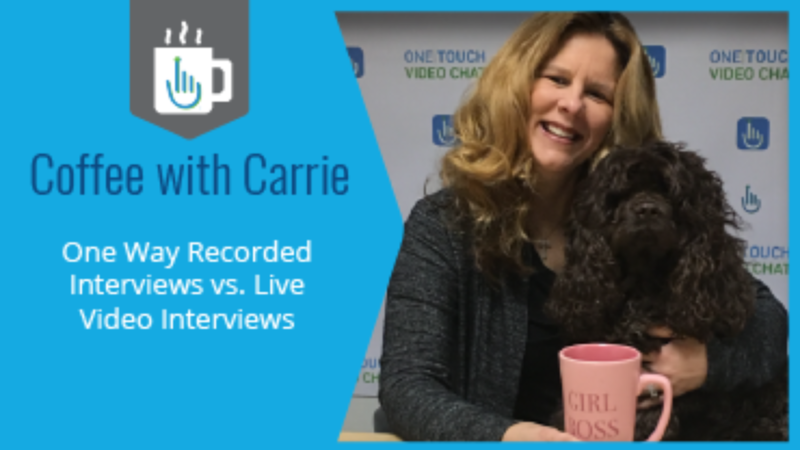 This Coffee with Carrie discusses the differences in One-Way Recorded Video Interviews vs. Live Video Interviews. There is a lot of misunderstanding when it comes to understanding the differences in one-way recorded video interviews vs. live video interviews. This video blog talks about the differences in each for you to understand what is right for your recruiting and hiring process. Pre-recorded live assessments otherwise known as one-way recorded video interviews allow you to have all candidates answer pre-defined interview questions through a short video answer, many recruiters and hiring managers say it adds significant time sifting through the videos. In addition, if you read reviews from the candidates perspective, they do not like “talking to a wall” and feel it’s impersonal. While there can be some benefits in “seeing the candidate” and forwarding this to other team members, nothing can replace the live video interview process of seeing how a candidate can answer questions and/or role play on their feet. The real savings and speed to hire are on live video interviews. This is the only process in which you can replace phone interviews and reduce the number of candidates that you wish to bring in for an in-person interview. Most companies have found that they still conduct a phone interview post the one-way recorded video interviews vs. live video interviews they can replace the phone interview and go straight to the in-person interview. This process is where the real cost saving is (up to 70%) and real reduction in the hiring timeframe (you can shave off 7-14 days). Furthermore, if you are in an industry where you need a competitive advantage, live video interviews allow you to make a personal first impression, help you stand out from the others and be authentic with the candidate from day one. Want Hiring Competitive Advantage in 2018? To learn more about Live Video Interviews.